People in several Arab countries in the Middle East and North Africa are again on pins and needles after witnessing new demonstrations. On Sunday, Yemeni President Ali Abdullah Saleh issued a decree to dismiss his government and vowed to form a new government -- two days after snipers shot dead 52 protesters in the capital Sanaa amid escalating protests across the country since mid-February. Tens of thousands of protesters took to the streets of the southern provinces of Ibb, Taiz, Aden, al-Hodayda and Hadramout on Sunday to condemn what they described as the "bloodbath by the security authorities against Sanaa's peaceful protesters." Many showed support to the families of the victims, and vowed to continue protest sit-ins until their demand was fulfilled. Earlier, a group of senior Yemeni government officials declared their resignation after Friday's shootings. They include Deputy Speaker of the Parliament Sheikh Himyar Abdullah al-Ahmar, Yemeni Ambassador to the United Nations Abdullah al-Saidi and several ministers. In a statement issued Sunday, some influential Muslim clerics called on Saleh to appease the demands of protesters and end his 33-year rule to avoid further violence. They also called for "President Saleh's elite Republican Guard troops to withdraw from the capital as there is no justification for the existence of all these forces." Saleh has earlier pledged neither to seek another term nor to pass power to his son. But he denied any links between Friday's shooting and the police. In Syria, seven security force personnel were killed Sunday in Daraa, 60 km south of the capital Damascus, when they tried to drive away protesters demanding reforms. Reports said dozens of protesters attacked the communication center and the national hospital, and burned the headquarters of the ruling Baath Party as well as the courthouse in Daraa. Clashes erupted Sunday between the Syrian police and protesters after two young men were reportedly killed by the security forces in the town. A local eyewitness told Xinhua that the Syrian police have surrounded the town to prevent people from entering it. 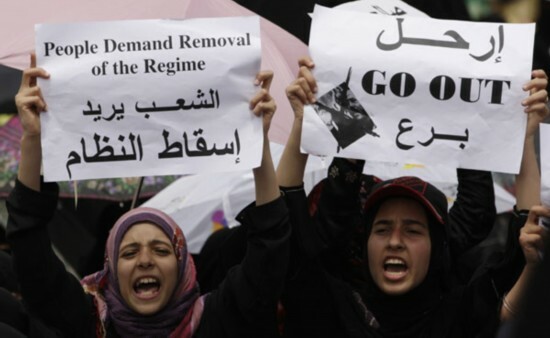 Also on Sunday, around 35,000 people took to the streets in major cities in Morocco including Rabat and Casablanca, after the reform pledge made by King Mohammed VI earlier this month failed to satisfy Moroccans. On Feb. 20, demonstrations that swept the nation as protesters called for reforms and limits on the monarchy killed at least five people and injured another 128. Many banks and shops were robbed. During the Sunday rally, people on the streets were still demanding faster constitutional reforms, a more ambitious crackdown on corruption, more job opportunities and better education and health care. But no major violence was reported, and the police did not intervene. In Bahrain, despite the reopening of roads and shops after earlier protests, the country's largest trade union body announced Sunday it would continue its nationwide strike until further notice. The General Federation of Bahrain Trade Unions (GFBTU) said the Bahraini workers were afraid to go to work with increasing police and check points on the roads. Attention: If you find mistakes in our website, please select the incorrect data and press "CTRL + ENTER".